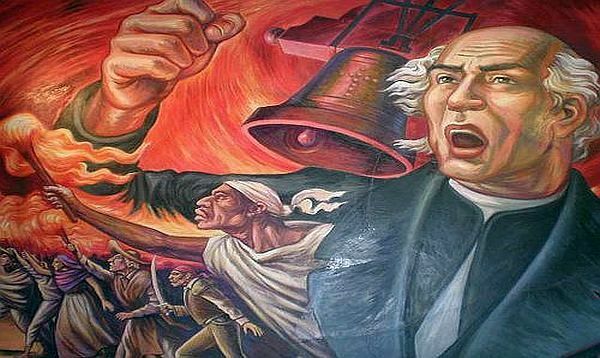 El Grito de Dolores was pronounced by Miguel Hidalgo y Costilla, a Roman Catholic priest, from the small town of Dolores on September 16, 1810. This event sparked Mexico's War of Independence. Puerto Vallarta, Mexico - Every September, known as El Mes de la Patria (The Month of Our Nation,) cities throughout Mexico host a series of colorful and patriotic festivities celebrating the first and most significant episode of the country's history - Mexico's Independence from Spain. As Independence Day approaches, one sees more Mexican flags of various sizes, being sold on street corners. Buildings and balconies are festooned with green, red and white streamers - the colors of the Mexican flag, and there is a celebratory feeling in the air. But September 15th, or the eve of Independence Day, is when the celebrations really begin with the traditional El Grito observance. Grito means "shout" or "cry." It commemorates the manner in which Miguel Hidalgo, considered the father of Mexico, publicly initiated what became the Mexican independence movement, in 1810. This was in the town of Dolores, now renamed Dolores Hidalgo, in central Mexico. Hidalgo, a priest, gathered the people in front of the church on the plaza, where he gave a speech and rang the bell, and called the people to action. In commemoration of Hidalgo's original Grito, the time-honored tradition is for Mexicans to gather in plazas in Mexican cities large and small to watch speeches and performances. As the clock begins to strike eleven, silence falls over the crowd as the Mayor steps onto the balcony of City Hall to ring the symbolic liberty bell and shout Vivas in honor of Hidalgo and other Independence figures. The ceremony reaches the high point when the crowd joins in proudly shouting out the names of the heroes of Mexico's Independence. When the grito ceremony ends, the sky lights up with multi-colored fireworks, followed by performances by traditional Mexican dancers and musical groups. The following day, September 16 is Independence Day in Mexico and is considered a patriotic holiday, or Fiesta Patria (literally, holiday of the Fatherland.) This day is marked by parades, patriotic programs, drum & bugle and marching band competitions, special programs on the national and local media outlets, and even concerts. Stay tuned for a complete list of Fiestas Patrias events in Puerto Vallarta.